Pros: THE SOFTWARE IS USER FRIENDLY AND EASY TO TRAIN USERS ON. Overall: MY OVERALL EXPERIENCE WITH ENVI IS GOOD. I REALLY ENJOY WORKING IN THE SOFTWARE. THERE WILL ALWAYS BE SUGGESTIONS THAT I THINK CAN BE DONE TO MAKE THE SYSTEM MORE USER FRIENDLY BUT OVERALL IT IS A GREAT SYSTEM. Thank you for your feedback, LaWanda. We have our development team looking at your session time-out settings. Please continue to use our feedback link within Envi to share your suggestions or issues. Our product changes and enhancements are customer driven, so keep them coming! Pros: Software is very user friendly and manages inventory accurately. Easy to keep track of multiple facilities and locations. Reporting feature is useful. End user training is easy. The app for your phone was a lifesaver! Cons: Nothing.... I have not found anything that I didn't like. Overall: Overall I am very satisfied with Envi. I enjoy working in the system and feel that it is more advanced than most software that I have viewed. Customer service is outstanding. Pros: The software allows users of any skill level to use efficiently. The ease of use promotes effective time management when placing orders, viewing reports and entering inventory counts. Over all a well develop system meant to meet my facilities needs. Cons: I haven't run into any cons. Any questions I have I can access the support right on the website that has plenty of resources. Overall: Experience has been great! 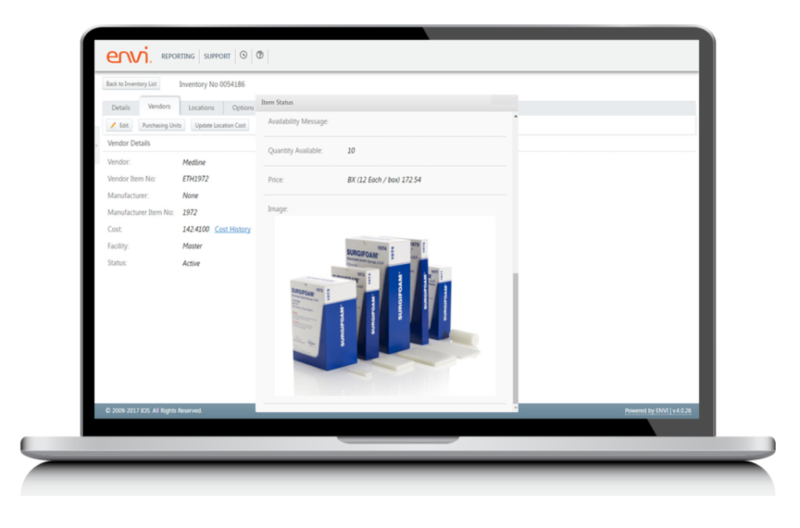 From the beginning I was provided the training tools to get to know the system and the features that ENVI provides. Since then any question I may have are addressed by our account rep that is very responsive! Overall: The Envi team has shown exemplary customer service. None better in the market. Pros: Makes placing orders much easier each week! Cons: Setting it up was very difficult and time consuming. Overall: Overall experience has been good. Rep with IOS is always so helpful to me!